Bits from "Worlds In Collision"
During the "1st Great Age": The Sun shone "all the time", there was no night, no rain (only a heavy mist) & the earth was populated by giants with "horny skin" ( Adam himself was said to be of giant stature). The "2nd Great Age": Then, a day came when the Sun ceased to shine. It "sank" beneath the horizon, disappearing & plunging all into darkness. The Sun then rose again the next "day" ... and so began the Time of: Days, Nights, & Seasons. During this "Second Great Age", the variety of species diminished. 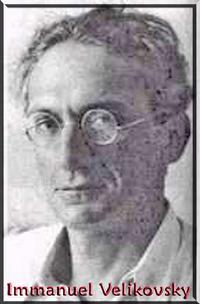 Man himself decreased in size (according to Hebrew legends); there was a “vast difference between his later and his former state between his supernatural size then, and his shrunken size now.” He also lost his horny skin. The whole of nature altered its ways. The traditions of peoples all over the world are quite unanimous in asserting that an an earlier time a race of giants lived on the earth and the majority of the "Giant" race were destroyed in great catastrophes. The giant races were in large part said to be of a cruel, cannabilistic & constant warring nature. The last of them were finally killed off during clashes with migrating humans also seeking new homelands during the same cataclysms. The First Age of Modern Man: The "3rd Great Age" ended with "Noah's Flood"( also referred to as "The Great Deluge". And, after Noah's Flood began the First World or Age of "Modern Man". All sources tend to agree that the earth was covered to the mountain tops by the water of the deluge coming from above, and that only a few human beings escaped death in the flood. The stories are often accompanied by details about a simultaneous cleavage of the earth. The Buddhist book on “The World Cycles,” the Visuddhi-Magga, describe the world terminating catastrophies: "...But when a world cycle perishes by water . . . there arises a cycle-destroying great cloud of salt water. At first it rains with a very fine rain which gradually increases to great torrents which fill one hundred thousand times ten million worlds, and then the mountain peaks of the earth become flooded with saltish water, and hidden from view. And the water is buoyed up on all sides by the wind, and rises upward from the earth until it engulfs the heavens. " It is also said that not one, but many arks or vessels were used as a means of escape, but they were ruined or capsized one after the other in the surging water.This passage would imply a warning was given of what was to come with time to prepare. This catastrophe of the Deluge, according to the Hebrew cosmogony, changed the nature of herb, animal and man. The prosperity of the time before the great flood was gone, never to return; the world lay in ruins. The earth was changed; even the sky was not the same. The Second Age of Modern Man ended in Earthquakes. During this time, the Sky fell upon the Earth & killed all the people & every living thing. Most of the Giants were destroyed during this time (except for a few scattered pockets here & there). The bones of these Giants were found by exploring Spaniards while digging mines and tombs. They were said to have been 20 hands tall. The Third Age of Modern Man was destroyed by Great Winds & Hurricanes ... it was during this Third Age of Modern Man that the Giants were said to be totally wiped out. What Adam Foretold: Adam made a prediction that the world was to be destroyed at one time by the force of fire and at another time by the violence and quantity of water. Adam's son Seth (and Seth's progeny) were Astronomers & Astrologers. Upon hearing Adam's prediction, they built the 2 pillars known as Joachim & Boaz. One was made of brick, the other of stone On these pillars Seth & his progeny inscribed their knowledge. The same on both pillars. In case the pillar of brick should be destroyed by the flood, the pillar of stone might remain, and preserve this knowledge for posterity. Each pillar told of the existence of the other. have gazed on Niagara as ours do now"
During the 19th century ... as men moved west and were ploughing up more & more land; the giant bones were turning up everywhere On the U.S.-Ontario border on the Grand River was found a huge Giant's City, houses with chimneys, blacksmith shop, 2 tons of charcoal, gold & silver metalwork. From Louisiana to Minnesota and further west ... giant bones were found. One find in particular was made in a town on the Indiana/Ohio border, was of a giant, 18 feet tall. This find was witnessed by the entire town, including the mayor & local doctor. With the giant was also found a 9 foot sword and an iron Assyrian style helmet of the type worn in ancient Nineveh. The find was sent to New York, and never heard of again. The Mound Burial Sites: Several hundred thousand mounds are known: the mound builder culture disappeared between 1200 - 1400 AD. Copper artifacts accompanied the bodies. These would appear to have been a Pastoral, Agricultural, culture; & their remains were found all over (especially at one site in Wisconsin). Their artwork: Statues of People, Mastodons, Deer, Birds, Lizards, Elephants, & Crosses; littered the landscapes. At one point, the Western America Giants experienced volcanic disasters & an outbreak of plague. Many of the Western Giants moved East, crossed the Mississippi & began warring with the Eastern giant tribes for land. Western Finds: 200 ( 7-9 feet) skeletons were found in Cayoga, NY ...BUT ... On Catalina Island in the 1920's, the curator of the Catalina Museum found 3,781 skeletons (7-9 feet) & 5,000 more in other nearby locations. Their writings (hieroglyphics) were found on ten foot tall sandstone steles. Ohio & Indiana ... copper & bronze armor & weapons ... hardened to strength of tempered steel. Northern peninsula of Michigan (and shores of Lake Superior & Lake Michigan along with Thunder Bay & Isle Royale) was site of the Copper mines. 1 1/2 billion tons of 99+ % pure copper was extracted over a 10,000 year period. Thunder Bay (city in and the seat of Thunder Bay District, Ontario, Canada) & Isle Royale (an island of the Great Lakes, located in the northwest of Lake Superior, and part of the U.S. state of Michigan; show remnants of giant docks. Poverty Point, LA. received that copper where various artifacts (like huge bowls) were made & shipped overseas. Aside from their great height .... their having 2 rows of teeth were spoken of often. After WWII; reports all but disappeared. Perhaps due to John Wesley Powell. 1879 & the Powell Doctrine: In 1879, John Wesley Powell was appointed head of the Bureau of Ethnicity at the Smithsonian. He declared there to be no proof of any pre-columbian contact in the Americas just aboriginal primitives and no writing. From then on, the theory of evolution was established the rule of the day. Powell died in 1903. His successor came up with the land bridge theory and hid away any red haired or blonde haired giants which interfered with his "theory" of pre-columbian America. 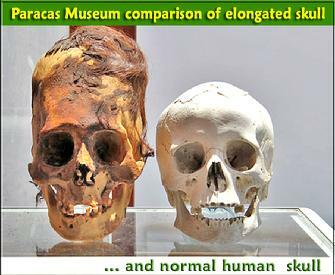 DNA results on Paracas Skulls - Paracas skulls From Peru: The cranial volume is up to 25 percent larger and 60 percent heavier than human skulls (cranial volume is genetic and cannot be enhanced). 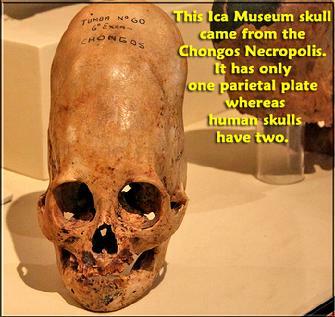 ________________________________________________ Geneticist: " ...if the Paracas individuals were so biologically different, they would not have been able to interbreed with humans." (mitochondrial DNA) with mutations unknown in any human, primate, or animal known so far. There is some debate on when the actual pyramids were built. Some archaeologists say after carbon dating it seems to be around 7,000-10,000 years ago. However, other debate this and say that they are only a few thousand years old and Egyptians only came around about 3,000 years ago, so it couldn't’t be older then that. BUT; What if the Egyptians did build some of the smaller ones, but not the great pyramid?